Engadget writes about Binary Pixel, a new imaging chip from Rambus that promises to achieve single-shot HDR photos on smartphones. Its new imaging chip tries to replicate the human eye's range through setting light thresholds and oversampling the scene in both space and time. The results are more natural shadows and highlights down to the pixel level, with processing processing fast enough for video. The overall image reportedly suffers from less noise as well. 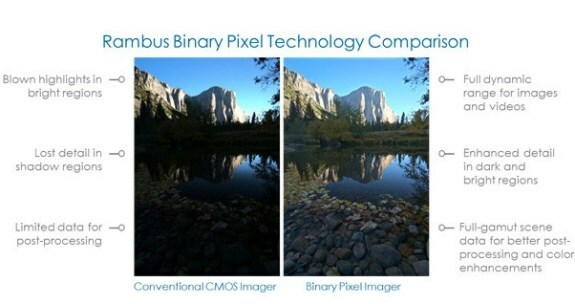 Companies will have to talk to Rambus to implement Binary Pixel, although it's a considered a drop-in technology that should talk to existing processors and camera sensors, whether it's for smartphones or point-and-shoot cameras. Rambus may just want to hurry if it hopes to get noticed -- it's joining an increasingly crowded field.